Council officials are recommending that the whole of the Lowfields school and sports pitch site be redeveloped. The planning application will be determined next week, even though objections to the Local Plan have not yet been considered by the independent inspector. The first is an outline planning application for the whole site (click) This still includes the highly unlikely Police station (the Police have no plans to move from their current York Road base) and a “health centre” although none of the NHS/GP budget holders have allocated funding for such a project. 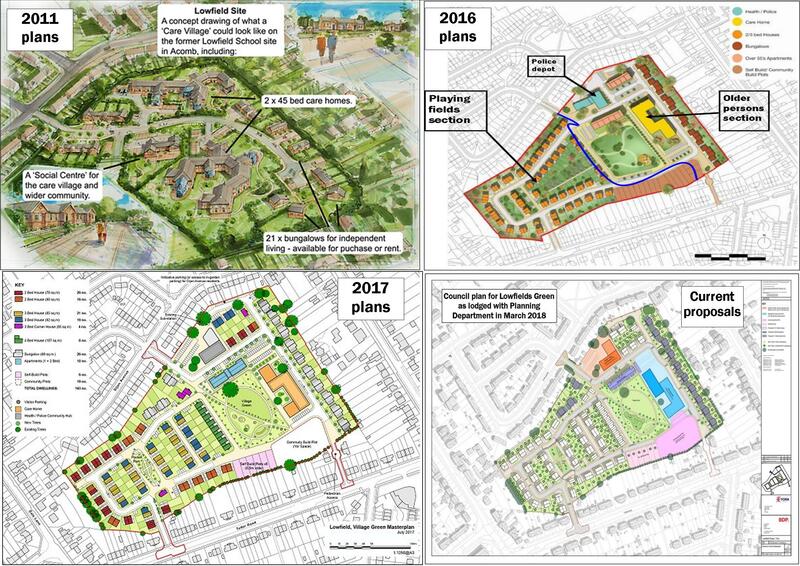 The application outlines where the Council hopes 96 houses, 26 bungalows, 18 apartments and an 80 bedroomed care home will be located. 6 self-build and 19 “community build” dwellings are also included near the southern boundary of the site. The second application is the detailed (i.e. final) planning application for the 142 “open market” dwellings (click). Strangely this detailed application is scheduled to be considered before the outline application!. The Council says that 20% of these will be “affordable”. 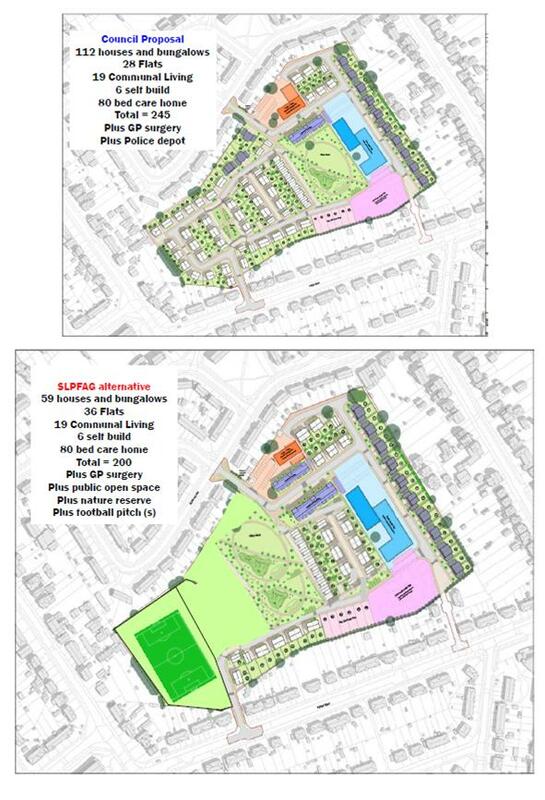 It is these housing plans which are likely to be most controversial as they are the ones being being built on the sports pitch. When the Lowfields school closed some 10 years ago, the Council gave an assurance that only the “built footprint” of the former school buildings would be redeveloped. The green space would be protected. The site was slated to be retirement village – the west York equivalent of Hartrigg Oaks. Plans were produced, and the scheme would have proceeded had there not been change in control of the Council in 2011. The incoming Labour administration wanted the village to be predominantly public (rather than private ) sector. They raised the possibility of building on the football pitch in 2012 but nothing came of the idea. Four years wrangling later and it was accepted that the development would need private investment. The suggestion that the green space would be lost came in December 2016 when the then new Tory housing executive member persuaded his colleagues that selling off the land for private development would provide the money (approximately £4.5 Million) for other projects including facilities in Burnholme. The Council claimed that “landscaped green space will be open to the public for the first time” In practice the playing fields were open to the public until about 5 years ago when the Council tried to secure the boundaries. At the time, they said this could only be a for a few months. 2017 – In October 2017 the Lowfields Action Group published an alternative proposal for the Lowfields site. This was fed into the Local Plan process. Its over 9 months since the deadline for comments on the planning application passed. None of the comments made by residents in response to the many earlier iterations are being reported to the Planning Committee next week. These is a growing suspicion that the Council – as the owner of the site and with a major vested financial liability – is not being even handed with all interested parties.